Naturally, your guest bedroom will be everything you would expect and more from an AA and Scottish Tourist Board Four Star Hotel. Our 32 Bedroom Hotel has a collection of Standard, Superior and newly built Executive Bedrooms, with three of the Executive Bedrooms benefiting from private balconies which overlook the Caledonian Canal. Each of our 32 rooms are tastefully furnished and individually designed to capture the sense of the Scottish Highlands. All our rooms have private en-suite bathrooms, hospitality trays, hairdryers, free wi-fi, satellite TV and a selection of quality toiletries. Breakfast in the Moorings Hotel is included in the room rate and is not to be missed. Breakfast includes a European style continental Buffet including fresh fruit, yogurt, cereals, pastries, cheeses and cold meats followed by a full Scottish Breakfast cooked fresh from our kitchen. A great start to a day out in the fresh Highland air. All residents of the Moorings Hotel have free access to wi-fi, free entry to our fitness Suite, as well as a complimentary round of golf at Fort William Golf Course. For more information please ask our reservations team on booking. Winter rates from £35 pppn/ Summer from £75 pppn. 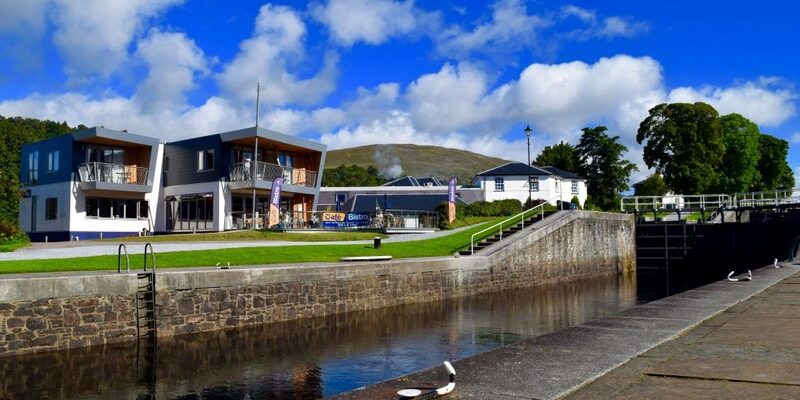 With the opening of the new Moorings Cafe Bistro in the summer of 2015, The Moorings Hotel is the number one place to eat in Fort William and an experience not to be missed. Residents and non-residents will be spoilt for choice, from our fine dining Neptune’s restaurant to our fantastic Cafe Bistro on the banks of the Caledonian Canal serving a great selection of traditional and modern meals using the best of local fresh produce. We are child friendly and offer a specialised children’s menu. We are open from 10am until 9.30pm serving meals and have the benefit of a Canalside decked seating area with spectacular views across Ben Nevis and the Caledonian Canal. Enjoy the views whilst you watch the boats make their way through Neptune’s Stair Case.